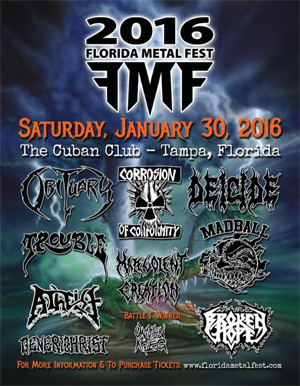 January 30th, 2016 will mark the official kick off of the first annual Florida Metal Fest! Organized by brothers John and Donald Tardy of death metal legends OBITUARY, and set to take place at The Cuban Club, Ybor City in Tampa, year one of the brutal gala will see some of the Sunshine State's most iconic bands - including OBITUARY, MALEVOLENT CREATION, DEICIDE and ATHEIST - unite and return to their roots in the very heart of the death metal world. Additionally, the Tardy brothers have invited some of their favorite bands from around the country to take part in this special event including CORROSION OF CONFORMITY, TROUBLE, MADBALL, BROKEN HOPE and GENERICHRIST! Two local Floridian bands, both winners of the Battle Of The Bands contest show, will be opening the fest. The first battle was held on November 27th at the BrassMug where the winning band was UNTOTEN KRIEG. The second battle will take place on December 26th at the Crowbar in Ybor City to determine the final band of this year's lineup. Said John Tardy of fest: "My brother and I have been so fortunate and thankful to be part of some the best and biggest music festivals in the world. The amount of people, bands and energy these festivals can bring is just awesome. From the first time we played one, it has always been a dream of ours to put together a music festival that is not only fun for the fans, bands and crews, but one that also brings a closeness to all involved. After years and years of talking about it, we finally decided the time is now. We want to put together a first class festival. From the venue to the PA, from the lights to the lineup we are trying our best to make this as memorable event as possible. No festival, anywhere in the world, even with the best possible lineup, would work if the area does not support it. I think that Tampa, and its surrounding cities, is a great music area and one that is ready to make this event come to life." The Cuban Club, Ybor City in Tampa, Florida, home to the Florida Metal Fest, is located just fifteen minutes from the Tampa International Airport. The Cuban Club is surrounded by dozen of bars and restaurants, includes easy parking and is in walking distance or a short cab ride to dozens of hotels at a variety of prices. For further info visit http://www.floridametalfest.com where you'll find ticket, lodging and travel info.